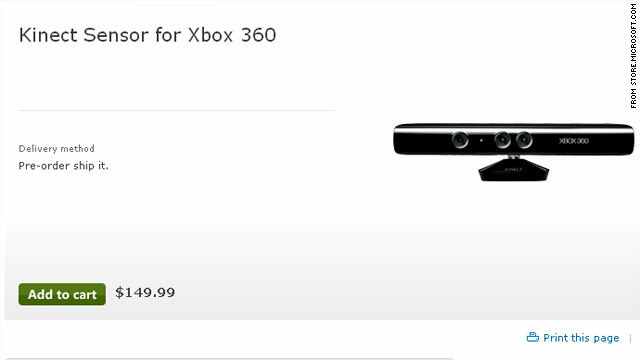 A page at Microsoft's online store said the Kinect motion controller for the Xbox 360 will cost $149.99. (CNN) -- During the Electronic Entertainment Expo, Microsoft unveiled a new name for its motion controller and showed off what Kinect can do on the Xbox 360. Microsoft never announced a price during the E3 last week, but shortly after its press conference, the online game store GameSpot had the Kinect listed for pre-order at $149.99. That page was quickly pulled, and Microsoft insisted that a final price for the new controller had not been determined. On Tuesday, a price for the gaming system, which has no handheld controller and uses a camera to read the player's movements, was posted on Microsoft's online store. The order form also shows the hardware players will need to have to use the Kinect. A Microsoft representative did not return a message from CNN.com seeking to verify the price, but the page had not been taken down as of midday Tuesday. The controller is compatible with the Xbox 360, and Microsoft suggests 6 feet of space between the player and the television. This distance will vary according to sensor placement and other factors. To connect with friends and family for game play or video chat, an Xbox Live Gold membership also is required. A power cable, manual and Wi-Fi extension cable are included with the Kinect. The order form said the package will be available for shipping on or after November 4.